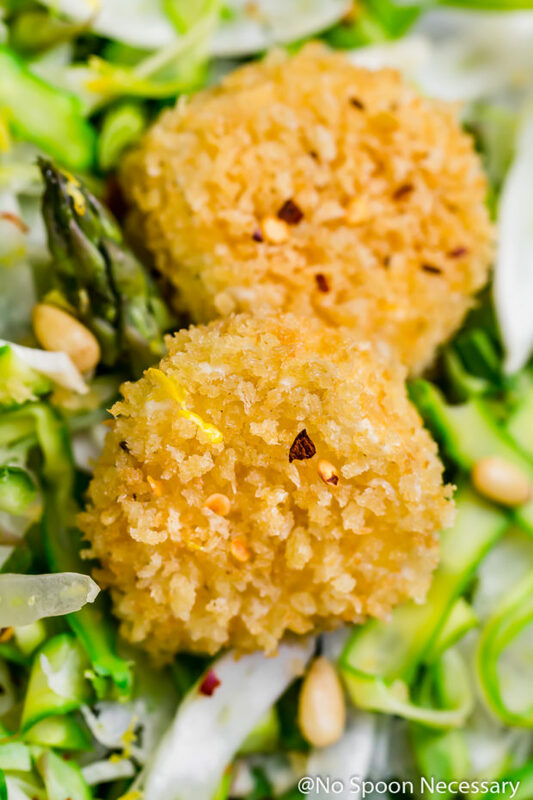 This Shaved Asparagus Goat Cheese Salad is fresh and light, yet packed with flavor! 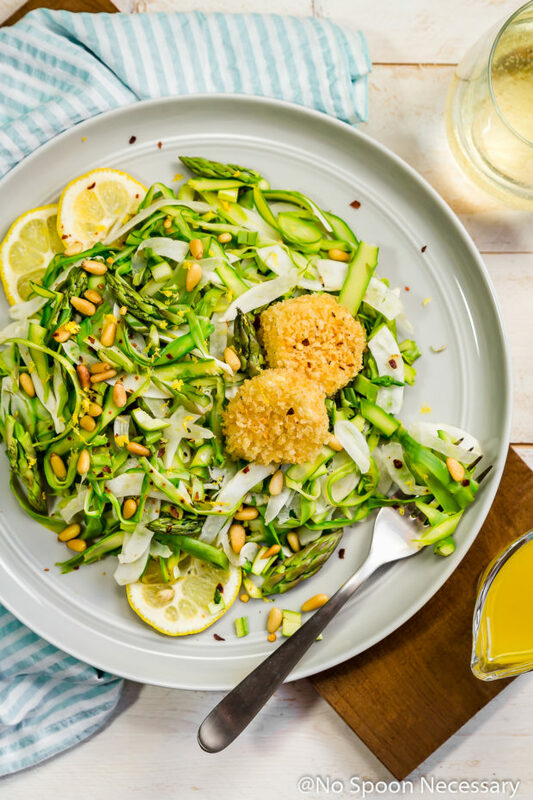 Delicate ribbons of asparagus tossed with fennel, then topped with soft, crispy baked goat cheese, crunchy pine nuts and finished with a smooth lemon vinaigrette. 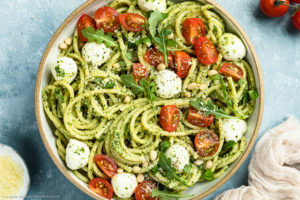 It’s perfect as a light meal or side! This post was originally published in May 2015. I made edits to the photos and changed some of the written post below to include more information about the recipe. How was everyone’s Memorial Weekend? Did you eat, drink and be merry? Maybe you indulged in a libation or three? So, did you eat or prepare anything festively fun? Do share! 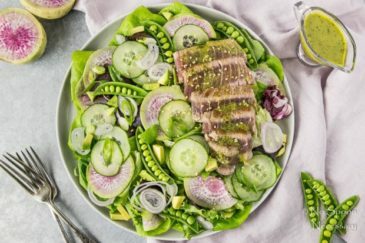 This salad is light, healthy and the epitome of summer freshness. Growing up I hated asparagus, my parents had to coerce me to eat at least two of the asparagus tips, out of the pile served to me, before I could be excused from the table. Let’s just say a lot of temper tantrums happened on nights where asparagus was served. I know I am not alone in this… we all have foods we grew up loathing, which now we adore and can’t get enough of. Asparagus is mine. What is yours? Despite hating the stalky, woodsy vegetable side of asparagus, I have always been someone who genuinely enjoys salads. #GetsItFromHerMama. As much as I adore a predictable leafy green salad, I totally swoon over an unexpected and vibrantly beautiful salad, such as this Shaved Asparagus Goat Cheese Salad. 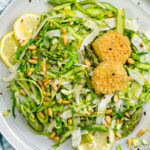 This asparagus salad is not only healthy and delicious, it is also a cinch to prepare, making it a sure fire winner in my book. The asparagus and fennel are first thinly sliced into long strands, which is easy-peasy to do with a vegetable peeler and mandolin. However, do not worry if you don’t have either, this task can also be done simply with a sharp chef knife. Slicing the vegetables uber thin provides a delicate texture to the salad, which is a nice contrast to the crunch of the pine nuts. 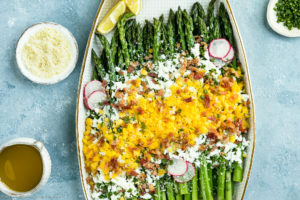 How to serve Shaved Asparagus Goat Cheese Salad? The asparagus and fennel can be served cold or warm, depending on your preference. 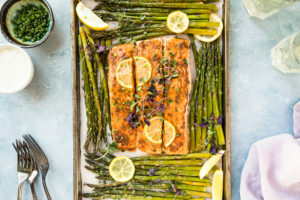 You can either slice the asparagus and leave it raw, blanch and shock the asparagus to partially cook, or roast the long thin strands for a warm, heartier feeling salad. I have included instructions for all three below in the recipe. I tried all of the different serving options, and to be honest, I loved all of them equally. Boy, however, preferred the latter two. Regardless of my relentless attempts, I still can’t get him into eating raw vegetables, unless it is a carrot or celery stick. 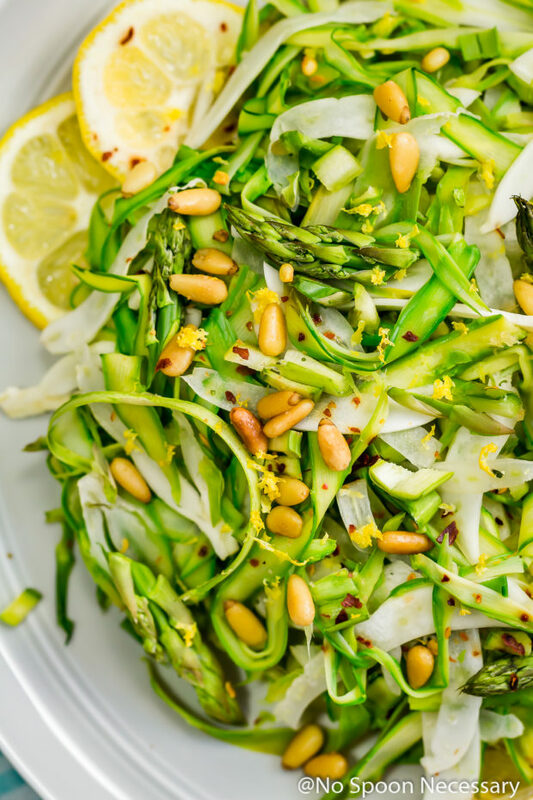 The shredded asparagus and leek salad is delicious as is, simply tossed with pine nuts, a pinch of red pepper flakes and a sprinkling of fresh lemon zest. However, I felt like it was begging to be gussied up a bit, into something seriously spectacular. This is where the baked goat cheese comes out to play. The cheese is cut into thick rounds and marinated in olive oil before being lovingly coated in toasted, crunchy panko bread crumbs. It then gets baked in the oven until it is just soft and gives slightly with the touch of your finger. The baked goat cheese adds creamy, tangy, crunchy decadence and really makes this salad magnificent. However no salad, including this Shaved Asparagus Goat Cheese Salad, is complete without a dressing. 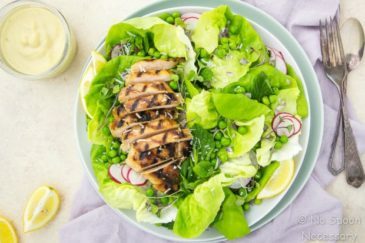 I chose to keep things light and refreshing, while also enhancing the overall flavors and textures of the salad, by preparing a super simple lemon vinaigrette. The vinaigrette provides a smooth, lemony, tart punch of flavor and finishes the Shaved Asparagus Goat Cheese Salad off perfectly. 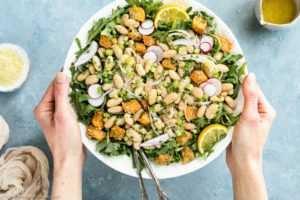 Honestly, this has become my new favorite salad for summer. If you live near me I must apologize for the shortage of asparagus recently at all the grocery stores. I have been buying all of their stock of asparagus, so I can devour this salad daily. You don’t have to forgive me for this selfishness, simply join me and prepare your own Shaved Asparagus Goat Cheese Salad. Pinkie promise you are going to love it as much as I do. Until next time, cheers and happy cooking (or should I say shaving?)! 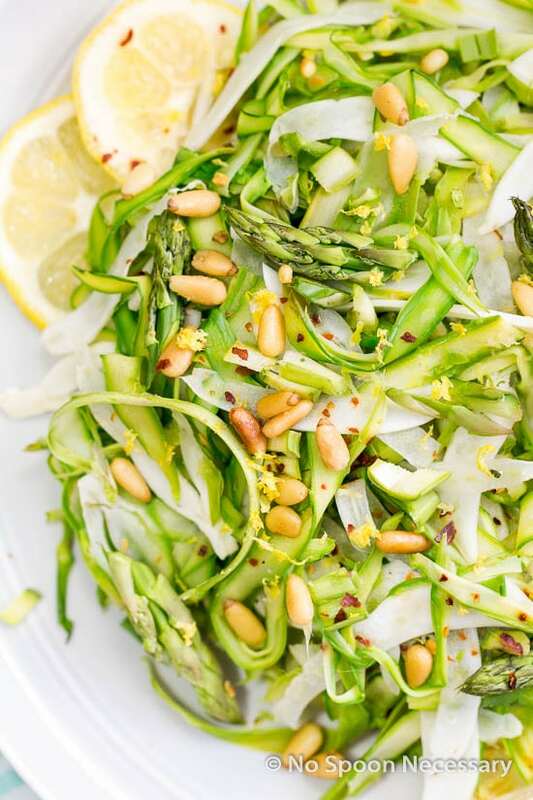 Shaved asparagus salad with fennel, pine nuts, baked goat cheese and a smooth lemon vinaigrette. Prepare the Vinaigrette – Mix all ingredients together in a small container with a tight fitting lid. Shake vigorously to emulsify. Alternatively, you can whisk all ingredients together in a small mixing bowl. For the Baked Goat Cheese – Cut the goat cheese log into 4 rounds, roughly ¾’’ wide and 1 ounce in weight each. Place rounds into a shallow baking dish and add olive oil. Transfer to the refrigerator and allow to marinate for at least 1 hour, up to 2 days, gently flipping goat cheese over periodically. Toast the Panko - Heat a small sauté pan over medium heat and spray with non-stick cooking spray. Add the breadcrumbs and toast, stirring often, until golden brown and evenly toasted, about 5 minutes. Remove breadcrumbs from heat and transfer to a plate. To Bake the Goat Cheese – Preheat oven to 375 degrees F. Line a small sheet pan with parchment paper and set aside. One disk at a time, remove the goat cheese rounds from the olive oil and place on top of the toasted breadcrumbs, pressing to adhere. Flip rounds over and on their sides to completely coat rounds with toasted breadcrumbs. Transfer to prepared baking sheet. Repeat until all four rounds are coated. Bake until soft to touch when gently pressed with fingertip, about 7-8 minutes. Remove from oven and set aside. 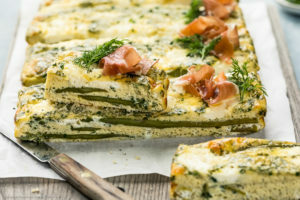 Prepare the Asparagus – Cut off the tips off the asparagus and place in a large bowl. Holding the woodsy end of the asparagus, use a vegetable peeler to shred, in downwards strokes, asparagus into long strands. Snap off the woody ends and discard. Dice the thin, leftover inward pieces of the asparagus that are too thin to shred and add to the bowl. Add the thinly sliced fennel to the bowl and toss to combine. For Raw Salad: Season the asparagus with salt and pepper to taste. For Semi-Cooked Salad: Fill a large bowl with ice water and set aside. Place a large pot of water over high heat and bring to a boil. Season the water with 1 tablespoon of sea salt. Place the asparagus and leeks into a large sieve and lower into boiling water. Boil for one minute, remove and immediately dunk sieve of vegetables into ice bath to stop them from cooking. Allow vegetables to sit in ice bath for at least 1 minute, remove from ice water, drain thoroughly and transfer to a large clean kitchen towel or paper towels and pat dry. For Roasted Salad: Line a baking sheet with aluminum foil and spray with non-stick cooking spray. Preheat oven to 400 degrees F. Roast vegetables for 7-10 minutes, or until desired doneness. Remove from oven and allow to cool slightly. 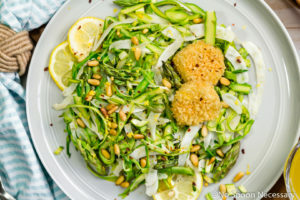 To Assemble Salad: Place asparagus and fennel back into large mixing bowl if you chose to cook them and season with salt and pepper to taste. Add pine nuts, crushed red pepper flakes and lemon zest. Toss to combine. Drizzle in vinaigrette to taste (you can always add more, so start with less) and toss again. 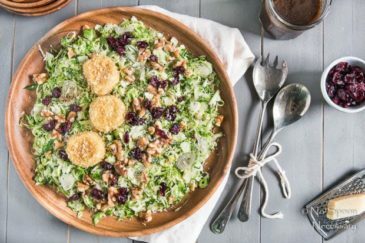 Divide salad among serving plates and top with baked goat cheese rounds. Serve with extra vinaigrette on the side. Enjoy. -If using a plain olive oil, add a sprig or two of a fresh herb, such as rosemary or thyme. *Baked Goat Cheese adapted from David Lebovitz. Italian and breakfast sausage. That’s my kryptonite. I can’t nor have I ever been able to stand the smell or taste of it. Luckily, my mom didn’t try to make me eat it when we had it. Just meant more for everyone else. But veggies I was all in! I love everything about this salad, Cheyanne. 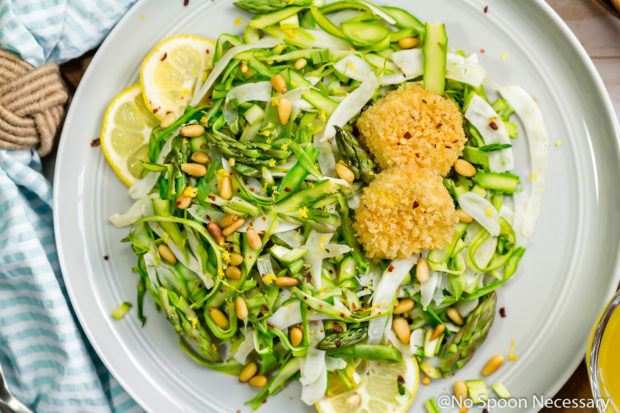 But I’m really knocked out by the combination of fennel and asparagus – two of my spring favs!! 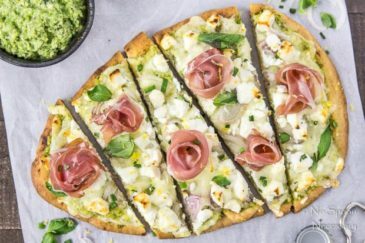 Making this beauty over the weekend!